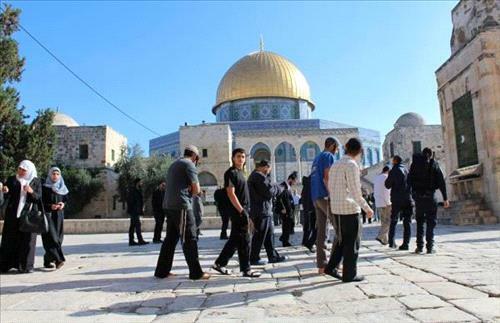 AMMONNEWS - A group of Jewish extremist settlers early Monday stormed Al-Aqsa mosque compound/ Haram Al Sharif in the occupied holy city of Jerusalem, a Palestinian source confirmed. The General Director of the Islamic Awqaf and al-Aqsa Affairs, Sheikh Azzam Al-Khatib, told Petra's reporter in Ramallah that today's raid by the extremist settlers was carried out from Al- Magharebah Gate under heavy protection of Israeli police. Al-Khatib noted that the settlers provocatively toured the compound and performed their Talmudic rituals, while Muslim worshipers, the Mosque's guards and al- Murabitun peacefully confronted them by chanting Allahu Akbar (God is Greater).